Every week, our panel of sports fans discusses a topic of the moment. For today's conversation, Emma Carmichael (writer, Deadspin), Hampton Stevens (writer, ESPN and The Atlantic), Patrick Hruby (writer, ESPN and The Atlantic), and Jake Simpson (writer, The Atlantic) talk about the beginning of the NCAA basketball season. In just about a week and a half, one of the greatest spectacles in recent sports history will take place: The men's basketball teams from North Carolina and Michigan State will play each other, in a game that will count, on a massive aircraft carrier on the water in San Diego. To be exact, the aircraft carrier is the USS Carl Vinson, which hosted Osama Bin Laden's burial at sea in May, and the game will be played on Veterans Day. And, to honor the military, the teams will be wearing camo jerseys that say "U.S.A." on the back instead of their last names. And here we've been, pining for the loss of the start to the NBA season. A reminder, everyone: There will still be basketball in this country this year, and it will still be great. It doesn't have its own television channel or a business element (although arguably it should), but it is, in my opinion, one of the most entertaining and engaging seasons there is. So let's talk college hoops—and aircraft carriers, if you'd like. I, personally, am utterly relieved that order has been restored and the Tar Heels are at the top of the preseason rankings, while Duke rests at a lowly No. 6. The rest of the top 25 is similarly predictable, as it always is, but the wonder of this sport is that come March, none of it will matter. Division I men's hoops has, in the past few years, actually come to know something resembling parity. Look no further than Brad Stevens's Butler Bulldogs. So in a game in which forecasts do no good (except, of course, for the fact that the Heels will be national champions this year), what are you looking forward to, Hampton? As far as I know, your Jayhawks don't have any games on an aircraft carrier this season—but surely, there must be something? Me? Manhattan and Maui, for starters. A few days after North Carolina dons those patriotic, yet undeniably ugly uniforms, KU visits the Greatest City on Earth, to meet Kentucky at the World's Most Famous Arena—if you don't count the Colosseum in Rome. Then the Jayhawks fly to the South Pacific, joining Georgetown, UCLA, and Chaminade for the EA Sports Maui Invitational. KU plays a game in Kansas City around Christmas, as they do every year, meeting hardy little Davidson at the Sprint Center, then wraps the non-conference schedule in Hollywood against USC. But, as filmdom's most famous fictional Kansan said, "There's no place like home." That's where KU will be when the calendar goes Spinal Tap on 11/11/11—on Naismith Court, in glorious Allen Field House, where the game as we know it began. Truth be told, though? It's a weak non-conference schedule. With good reason. The team lost a ton of talent from last year, and three—count 'em three—highly recruited freshmen have been declared academically ineligible. While the Morris twins and Josh Selby are off somewhere not playing in the NBA, their former team will go through the season with only eight players on scholarship. That's trouble, because March Madness isn't the only thing that matters. Not in Lawrence, anyway. KU has won or shared the Big 12 title an incredible seven straight times. Winning an eighth, especially with this roster, would be spectacular—no mater what happens in the postseason tourney. How the team plays matters, too. Last year's club was just plain thuggish—with the twins throwing elbows on the court and putative team leaders acting like fools off-campus. It was embarrassing. This KU club needs, as a former Tar Heel player and Jayhawk coach used to repeat ad nauseam, "to play the right way." For me, anyway, that means making grades and staying out of trouble off the court as well as making extra passes on it. And you, Patrick? What's got you excited to see the amateurs play? In one breath, you extol the glorious, unmatched tradition of Kansas basketball; in the next, you hem and haw and sandbag and proclaim that the Jayhawks winning a mere conference title would be a spectacular achievement akin to putting a man on the moon, or perhaps the invention of the beer cozy. In terms of sheer humble-bragging, have-it-both-ways, expectation-managing chutzpah, are you sure you're not a Duke fan? But, as usual, I digress for the sake of a cheap shot. What has me excited for the upcoming college basketball season—beyond the chance to watch actual hoops, as opposed to looped footage of Derek Fisher and David Stern walking in and out of buildings—is the tiny-but-very-real chance to not watch hoops, thanks to a possible player sit-down/boycott of the wheezing, unfair, unsustainable, un-American system that is big-time amateur college sports. Unlikely? Yes. Impossible? No. Not anymore. 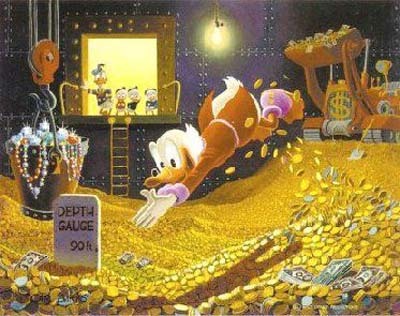 The long con of amateurism has reached its early terminal stage, via in-progress antitrust lawsuits and eyes-wide-open scholarship and a general sense that, hey, maybe that giant pile of television bullion should belong to the football and basketball players putting in 40-plus hour workweeks and risking concussions, as opposed to Scrooge McDuck, NCAA compliance officer. (Exhibit A : the Two-A's new $2000 non-stipend stipend for college athletes, the equivalent of saying women should be allowed to acquire secondary education, but let's not get all crazy and let them vote). Nothing would give amateurism a much-needed shove off a cliff like a player boycott. A work stoppage, if you will. Athletes exercising the most potent—and really, the only—leverage they have. Imagine the teams in the NCAA title game (say, Kansas, if you're particularly imaginative) sitting down at center court after the opening tip, refusing to play. Imagine all the teams in March Madness—or just on one regular season weekend—joining in. You think the network sugar daddies that pay a premium to sell game-time slots to advertisers might demand some immediate changes? You think university presidents might have a bit more motivation to stop sticking their heads in the sand, and by sand, I mean the aforementioned pile of gold? A boycott would be fraught with risk. College athletes would be putting their futures on the line. Doing so would take major cojones. According to former UMass guard Rigo Nunez, a number of college players nearly staged a sit-out during the 1995 NCAA tournament. They got cold feet. Similarly, Taylor Branch reported in The Atlantic that an unidentified college team once planned to boycott the NCAA title game if they advanced that far. They fell short. (The team in question is widely believed to be UNLV's 1991 squad; if Greg Anthony, Larry Johnson, Travis Bice or anyone else in the know wants to spill the beans, contact me! I'm eager to tell your story). Jake, are you with me in anticipating a college hoops revolution? Or are you just waiting for some good games? Jeez, Patrick. I think there's an angry, poorly-constructed sign in Zucotti Park waiting for you to hold it aloft. Also you neglected to mention the most famous basketball-related "boycott"—the threat by the 1964 NBA All-Stars, including Wilt Chamberlain, Bill Russell and Jerry West to boycott the All-Star Game over a pension dispute. Just minutes before the game was supposed to go on, the owners caved and agreed to the players' demands. Maybe Russell, who recently joined Ed O'Bannon's lawsuit against the NCAA, could give today's college hoops stars some tips. If not, I'm looking forward to watching Northwestern finally make the NCAA tournament. My beloved Wildcats are the only power conference program that has never made the Big Dance, which is ironic since the school hosted the first NCAA tournament in 1939 (the site of the tourney, Patten Gymnasium, is now used for such watershed events as pickup basketball games, fencing practice and Ludacris concerts). Much like the pre-1955 Brooklyn Dodgers, Northwestern fans have developed an almost perverse hope that blooms every November and withers by mid-March, our own reverse winter from Hell. Our current coach, Bill Carmody, has been at the helm for 11 years without a tourney berth but lingers on, like Joe Paterno without the success. But I'm calling it this year, people: We're making the Big Dance. Senior forward John Shurna is a beanpole of a man who can find a way to score from anywhere on the floor. Junior Drew Crawford, now a season removed from his Big Ten Freshman of the Year campaign, is a talent waiting to explode. And though the conference has several strong teams this year, it is short on dominant big men (Ohio State's Jared Sullinger is the notable exception), which should mitigate the Wildcats' glaring size disadvantage. The rest of you can drone on about North Carolina, Michigan State, and Kansas, the investment banks of NCAA hoops. I'll be glued to the mom-and-pop shop that is Northwestern. Here's to making history. See more posts from the Sports Roundtable.